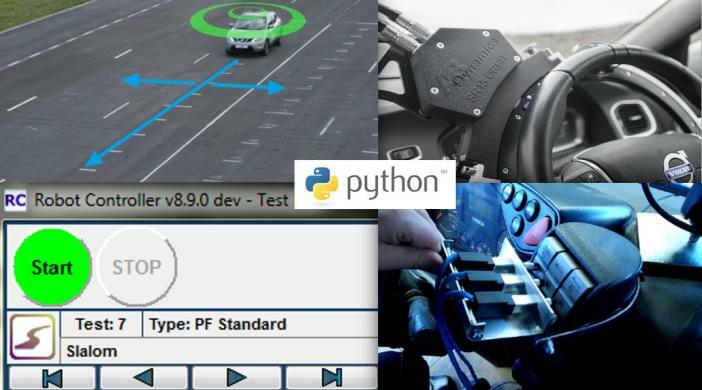 Python User Scripting is the latest innovation from AB Dynamics allowing customers to run their own software script programs on power controllers during a test. Based on the powerful and easy to use Python programming language, users can access all of the data capture channels such as SR/BR/AR data as well as motion pack and path following data to perform their own logic and calculations during a test. Key features of the system include real-time path following override controls, gear selection override, MP start time override, custom data capture and raw CAN-bus access. The module contains 32 general purpose script trigger channels and 16 advanced real-time data capture channels which can be used for live data viewing, data capture and triggering of test events. For External Following tests, a new option allows for robot actuators to be commanded directly from your Python script allowing customised open loop tests to be run in real-time. The user is able to set path following, speed and time control overrides along with adding new dynamic path segments with straight lines, curves, spirals and lane changes whilst the vehicle is in motion. Raw access to the CAN-bus input and output is possible where customised output messages can be constructed that can allow interactions with the host vehicle for actions such as flashing the vehicle headlights or turning indicators on and off. Virtual software interaction allows the user to virtually press test Start button in RC Software or controls from the DBS software right from the Python User Script.